At FirstLink Communications Inc., our customers come first. Establishing a long-term partnership and relationships by our professionalism, hard work and honesty. Our well educated and trained professional staff are here to help you all 365 days of the year. 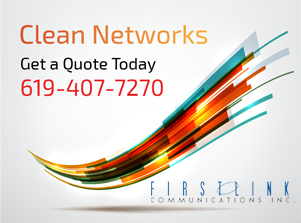 FirstLink Communications Inc., is eager to help you on your communication needs, offering you network designs, voice and data infrastructures, network services, audio visual, fiber optics and MAC services. At FirstLink Communications Inc., we are able to offer you a low-cost turnkey solution that will meet your budget because of our ability to bundle all our telecommunication services, high quality and educated technicians. Our Mission is to provide the highest professional quality and cost effective telecommunication solution. To maintain customer relationships by setting the highest standards and expectations in the industry. To provide the fastest service response to keep your business running.